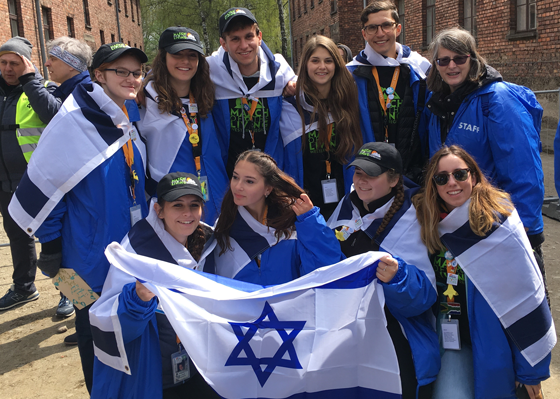 Through your generosity, Federation sends hundreds of young adults annually to experience our Jewish world firsthand. Here is Giana's story from her recent trip with March of the Living. Auschwitz. I know this word from pictures, videos, and the literary documentation of the events that took place at this concentration camp active during 1940 and 1945. Yet, this word was just simply a concentration camp, of course there are undeniable emotional responses evoked by the word alone, but there I was unaware that I had a major gap in understanding of the tragedy that occurred. About thirty minutes ago I was standing inside gas chamber one, facing the walls that were coated in scratches from top to bottom. Small etched Stars of David were weaved in with the marks that fingernails left on the cement. No picture can evoke the same experience as touching your own hand with the marks of desperation that were left by Jews experiencing their last moments gasping for air. Looking at an image through a screen can say a thousand words but standing on the same soil that contributed absorbed so much blood of my heritage. Nothing but this experience can close the gap in my understanding in how 11 million people who had futures and families were gone from the earth 6 years later. The horrors that we saw today are unimaginable. No matter how educated you are on the holocaust I believe that no experience can replace the effects of standing where our ancestors once stood. Every student on this trip can offer a particular moment that they can declare their gap in understanding closed. A moment that is unique to them because only they experienced it in that exact way. A moment that changed them forever. I experienced this moment today. Walking into the area that specifically was built for the execution through means of shooting and hanging I began to process. As I approached the wall of metal made to line the sentenced in front of I found myself fallen to my knees with tears dropping into the mud. My surrendering was unexplainable. This sudden catharsis of emotion was full of fear sadness relief. All emotions surely felt by these people who were faced their brutal death in this same spot. I got to walk out of Auschwitz today. 11 million people didn’t have that chance. It was stolen from them. Let it be our mission to honor their memories and celebrate those who did survive and walked out of those gates.